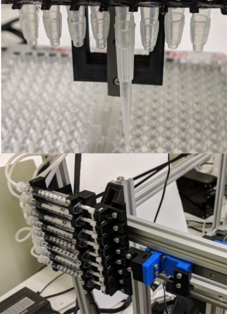 The motivation for developing this technique is to not use a multichannel pipetter (like these) that is limited to the both the volume, pipette tip, number of pipette tips and flow path. This multichannel tool is based on using a stepper motor linear actuator that can be controlled in a similar way as an extruder is in a 3D printer. Here described is how disposable P1000 tips can be modified to function as probes for interfacing with different types of disposable pipettes. Each of these probes can be connected to a separate syringe. Since the flow path is 1ml (in this example, disposable 1ml syringes are used, but larger syringes are also possible or ... it is possible to attach a three way valve for each syringe). 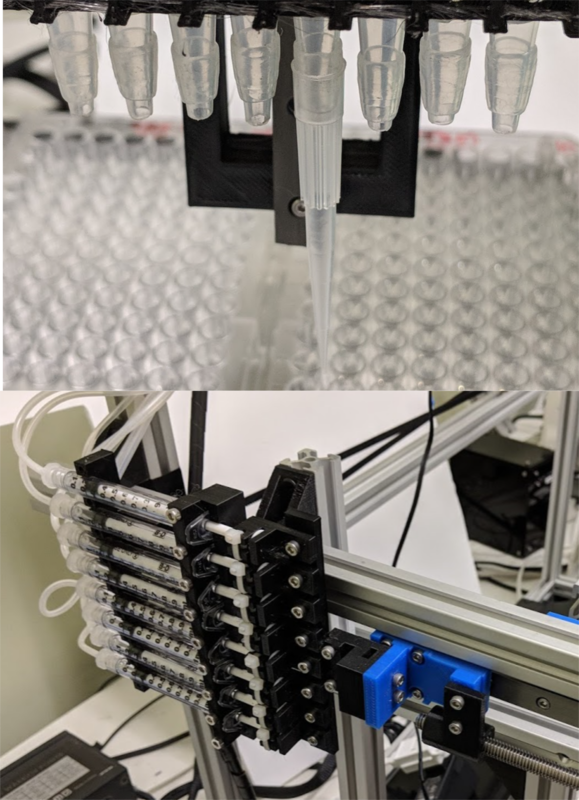 There is a camera module that can be used for visualizing the pipettes or spotting targets which can be easily adjust along the X axis and pivoted. This can be removeable. On either side of the probes there are connectors that attach the camera module to the pipetter probe holder. Those connectors are the same shape as the probes and are fixed in the pipette probe holder the same way that the probes are fixed. The probes are easily removeable. This is convenient. So for some applications you may want to use 8 tips (like ELISA plate washing) whereas in other applications like video microscope targeting or if you want to wash tips and not need so many, then you could use just 1 probe. The probes are modified disposable pipette tips. The P1000 manufactured by Eppendorf work really well. To create a tight seal a 1/16 inch inner diameter tubing about 20mm long is pushed up the smaller diameter pipette orifice. The position of how high the tubing is pushed up will depend on the type of pipette tip used. There is also a 1/8 inch tubing that is put into the pipette type through the larger orifice this tubing also includes a 4.5mm diameter rubber gasket for sealing and a luer lock barb for connection to a syringe. For multichannel applications using 8 tips, there is some tinkering needed to make sure all the probes load the tips smoothly together, but it works well once the adjustments are made (example). Also it maybe needed from time to time to replace the probe which is described on this page.